Explore the realm of dreams and imagination, where your dream symbols speak to you in metaphor and the world provides signs and symbols to guide you. In the Invisible Realm, you’ll develop your compassion and intuition, and once you recognize the signposts, find your way to greater conscious awareness and a more awakened life. 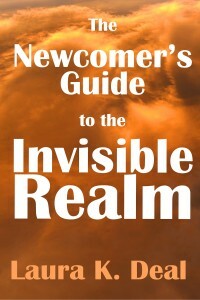 “The Newcomer’s Guide to the Invisible Realm” includes discussions of dreams and their meanings, synchronicity, oracles, poetry, and imagination. An extensive appendix explores specific dreams and dream symbols. For those who are curious, this book provides an accessible introduction to the Invisible Realm. Laura K. Deal, Ph.D., the author of the just released book titled The Newcomer’s Guide to the Invisible Realm: a Journey Through Dreams, Metaphor, and Imagination, is a wise woman and a wordsmith. She is also a writing teacher and a certified Dream Work Facilitator through the Marin Institute for Projective Dream Work, trained by Dr. Jeremy Taylor, co-founder and past president of the International Association for the Study of Dreams. I’ve witnessed Dr. Deal’s wisdom at dream retreats conducted by Jeremy Taylor and Billie Ortiz. Ortiz has aptly referred to her as a “warrior of the unseen world.” Deal’s book is an example of the projective style of working with dreams that I most respect. At her retreats, participants comment on possible dream meanings as if the dream had been their dream. In other words, everyone projects his or her own inner issues and life experiences onto the dream and the dreamer can decide if the projection fits. When it does, the dreamer has what is called an Aha! moment of understanding at least one layer of possible meanings for the dream.Deal uses this projective dream interpretation style in her book, willingly sacrificing her own privacy in order to illustrate the technique. Her book also shows, in a simple way that’s easily understood by newcomers to this realm of thinking, how this same process of projection explains the mystical phenomena belonging to the Tarot, I Ching, Astrology, Clairvoyance, and oracles of various kinds. She stresses the richness and depth of meaning that our lives can have when we are open to these experiences and understand them metaphorically or symbolically. In the opening chapter of The Newcomer’s Guide to the Invisible Realm, Deal explains that she grew up in a family of mathematicians deeply rooted in the rationalist viewpoint in modern Western culture. “I enjoy the fruits of our greater rational understanding and clever inventions every day, and I don’t reject the rationalist, materialist, scientific viewpoint… But there hasn’t been enough research on the powers of the mind to widen that viewpoint to include intuition and telepathy and the meanings of dreams.” I agree. I loved reading this book because Deal authentically presents her views, illustrates them by using her own life experiences, and doesn’t disparage other slants on life different from her own. This fascinating book explores the world of imagination: dreams, poetry, prayer, oracles, synchronicity, all using the entertaining metaphor of a travel guide. There’s an extensive dream dictionary in the back that’s like no other. The author intentionally asked on her blog (First Church of Metaphor) for dream symbols that people wanted to explore. Many of them aren’t in standard dream dictionaries, things like penguins and cannibalism and a broken pelvis and dolmens and transgender roles and bare feet. But she also explores some very common ones like being naked in public and flying. And the dictionary is more like an encyclopedia, with rich and thoughtful entries for each symbol.The author uses events from her own life and from the lives of friends and family as examples in this very personal yet very universal book. She has been a professional dream worker (or, to use her preferred title, a dream reader) for several years now, and has studied under Jeremy Taylor and Robert Moss.